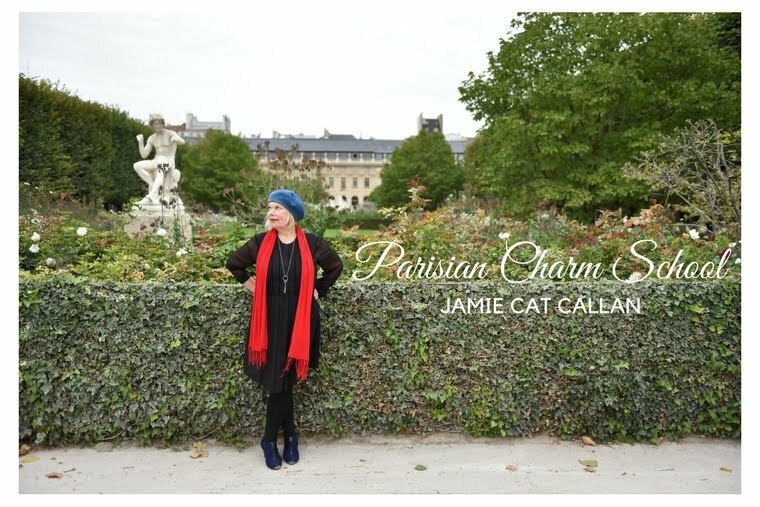 Jamie Cat Callan: French Women Love Polka Dots! French Women Love Polka Dots! Last week I met with Madame Poupie Cadolle in New York City. Her grandmother invented the modern day bra and her mother, Alice, actually created undergarments for Coco Chanel's non-corset styles of the 1920's. 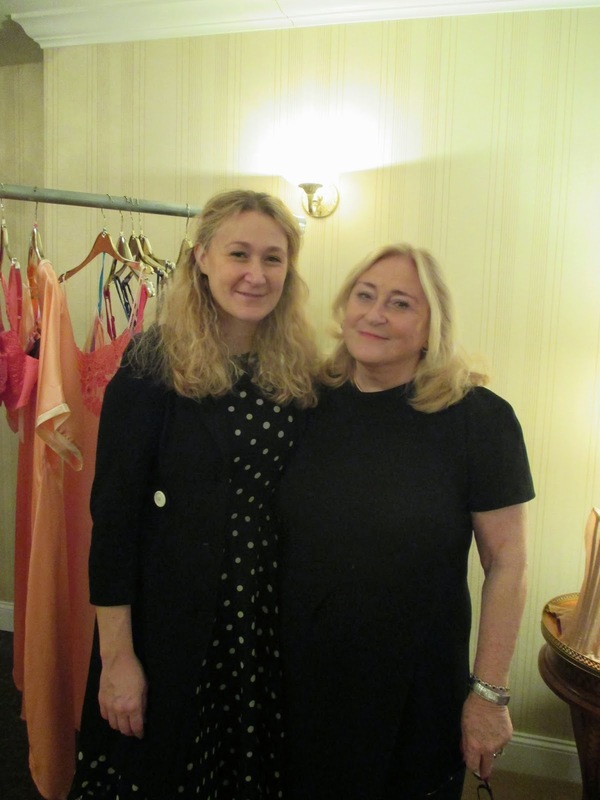 And now, her lovely daughter, Patricia, is part of the Maison Cadolle legacy. Please notice how Patricia is wearing a polka dot dress. I told her how much I liked her dress and she laughed, saying oh, French women love polka dots! And then her mother, Madame Cadolle agreed. I was so pleased and excited by this, because I love polka dots too! And you know what--my French-American grandmother loved polka dots. She owned a beautiful navy blue silk suit with tiny white polka dots. I had forgotten about that until that very moment. And so, mes amis, I encourage you to try out polka dots. You can start by wearing them underneath a pretty cardigan. 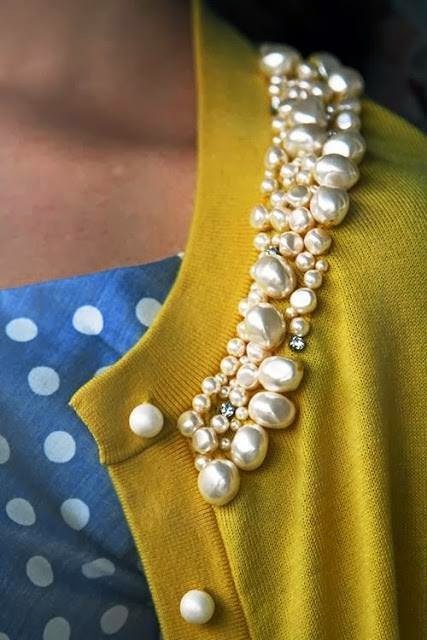 Or you can be more bold, and wear a skirt or dress with polka dots. Aren't they whimsical and fun?! I haven't worn a polka dot dress or skirt in many years, but now I'm going to reconsider and begin my search for cute polka dots! But who sells them nowadays? Any suggestions to help with my polka dot search? I'd love to hear your thoughts, mes amis. Photo of Madame and Patricia Cadolle by me, polka dot photos by Simply Feminine. I saw a sweet sheath dress by Ralph Lauren which was in a polka dot pattern...unfortunately they did not have my size in stock or I would have been wearing it to Paris on the tour! I spotted lots of polka dot scarves and accents in Paris in May. It's an easy pattern to wear and mixes with other patterns too. Merci beaucoup! I am so excited to hear this. Could you recommend a particular shop to find the polka dot scarves in Paris? I'm returning with my Ooh La La! Paris Tour in May and would like to make this part of our tour! xo Jamie P.S. I love-love-love your blog and have followed you for years! Sometimes the internet is truly the genii of the magic lamp! Mod Cloth , Forever 21 and Ebay sorted out a great selection of polka dots for us, and that's just three sites. There are more! I am so sorry that I missed this event at the Fashion Institute of Technology in New York with Madame et Mademoiselle Cadolle. I was in Manhattan for the following weekend. Tant pis!